Published by Martin Carlsson, March 25th, 2019 in Projects. Ksana Sweep Watch Face got some major updates recently. You can now customize in what way you want Ksana’s 5 content areas to be interactive (i.e. what should happen when you tap on them). 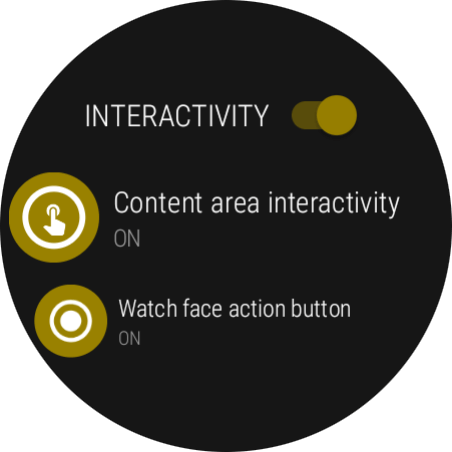 And there is a new interactive area called “Watch face action button” that can be customized to trigger different actions when you tap on it. 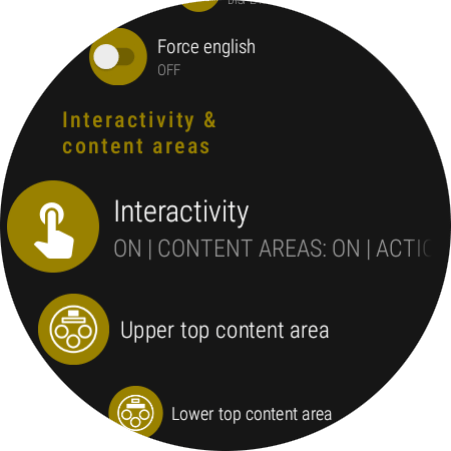 The interactivity setting is – just like any other setting – accessible both via Ksana settings on the watch and via the Ksana settings phone app. Just find the first item called “Interactivity” under the section “Interactivity & content areas”. The interactivity settings consists of 2 parts, namely Content area interactivity & Watch face action button. There are 2 types of interactivity for content areas. Make it (& the complication displayed within it) maximized. From this maximized state you can tap again to minimize it. You can also tap on the top right complication action button to trigger the complication action (if the complication has an action, not all has actions). Or, in case you previously added app shortcuts to be visible below the maximized content area complication, you can tap to open one of them. You can even use the arrow buttons to the left & right of the maximized content area to change what complication it should display. Some complications displays extra information in maximized state, while other gets slightly bigger & more readable. The built-in Step counter will for example display the step goal as well in maximized state. A tap on its top right complication action button will open Google Fit (if Fit is installed). This is the recommended type of interactivity since you can access any added app shortcuts in maximized state. Also, when you wish to directly trigger a complication action you can double tap instead. Trigger the complication action directly (again, not all complications has actions). If there is no complication action, nothing will happen. A tap on the built-in Step counter would for example open Google Fit when you tap on it. 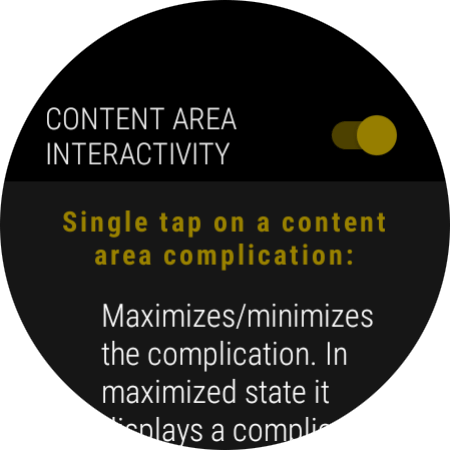 There are also a few more settings related to content area interactivity, for example if you wish to display visual feedback when you tap on a content area. The watch face action button can be customized to be displayed in either the lower right or the lower left corner of the watch face. It can also be made invisible in case you think the watch face gets a too crowded design when its visible. Turn content area interactivity off and on (effectively a content area interactivity lock). Change the content area interactivity type (i.e. maximize or trigger complication action directly, see above). Change type of second hand movement: sweeping or ticking. Turn the snowfall effect on or off. These new interactivity changes were implmented in version 1.6.2. Latest version is 1.6.3. You can verify that you got the latest version by going to the About page on either the Ksana phone app, or Ksana settings on the watch.